April | 2013 | OccasionalPiece--Quilt! Posted on April 30, 2013 by Elizabeth E.
I have the Four-in-Art reveal tomorrow, so am writing about my works in progress today. And if you read my Instagram, you know I cleaned out my sewing studio drawers this week as I was looking for a spool of thread and one thing lead to another (plus I was doing Grading Avoidance, a truly marketable skill I’ve developed), but while doing all that, found this sweet little Polaroid patch that Debbie sent to those who participated in the Polaroid Swap last summer. So I was able to get that stitched next to the label on onto Snapshot, and calling it FINISHED. 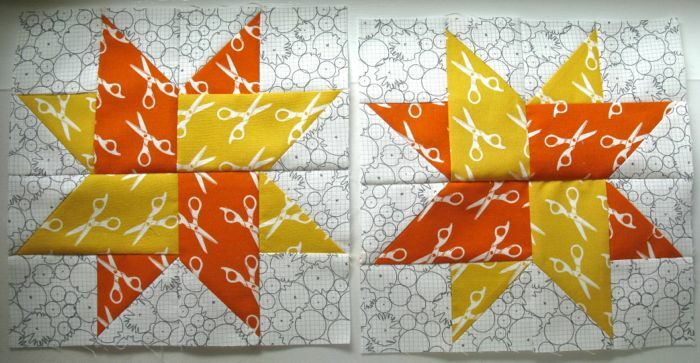 Not one, but two quilt squares for the Mid-Century Modern Quilt Bee. 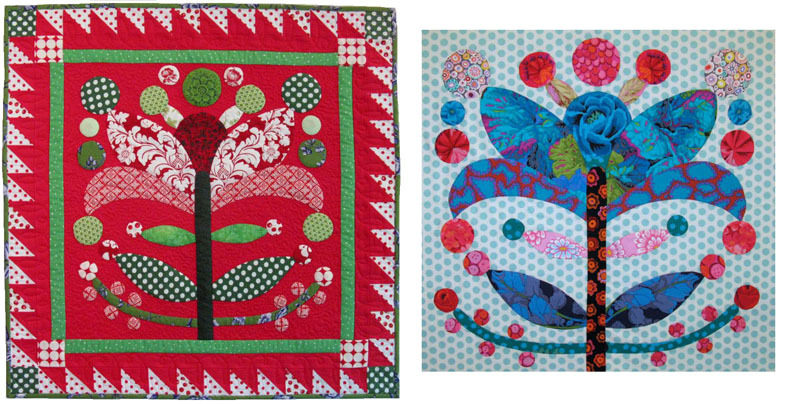 I don’t tend to press the heck out of my blocks, as I don’t believe in wearing out my quilts before I get to use them. So maybe the one on the right doesn’t look quite as spiffy as its twin. But it is just fine, really. Yeah, yeah, yeah. I’m still thinking about it. 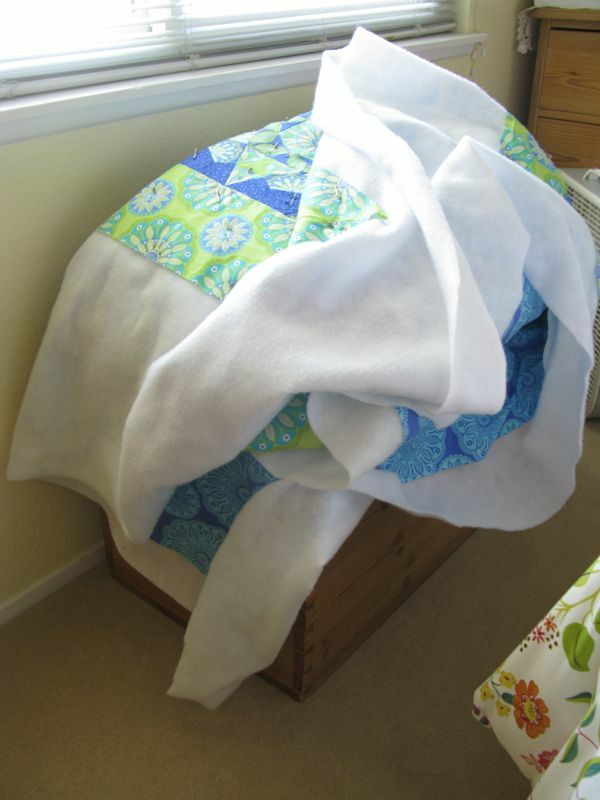 It’s my EPP quilt, and the top is completed, but I’m not going to show it until I’ve finished it. It’s coming. A new crazy idea that surfaced one day last fall, and has taken this long to bubble up. 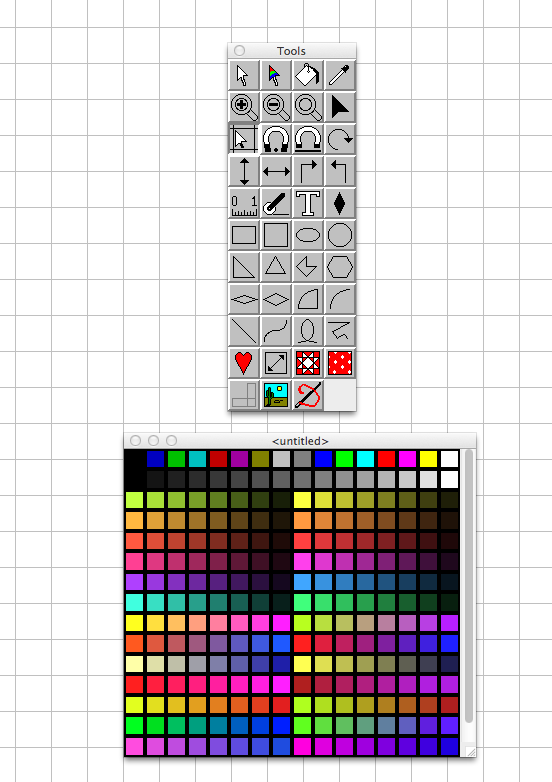 I’m showing you the bitsiest vision of it I can, because frankly, at this point, it’s really really a Work-in-Progress. Yep, I swiped this photo right from Anne’s website (she’s having a sale on her patterns). 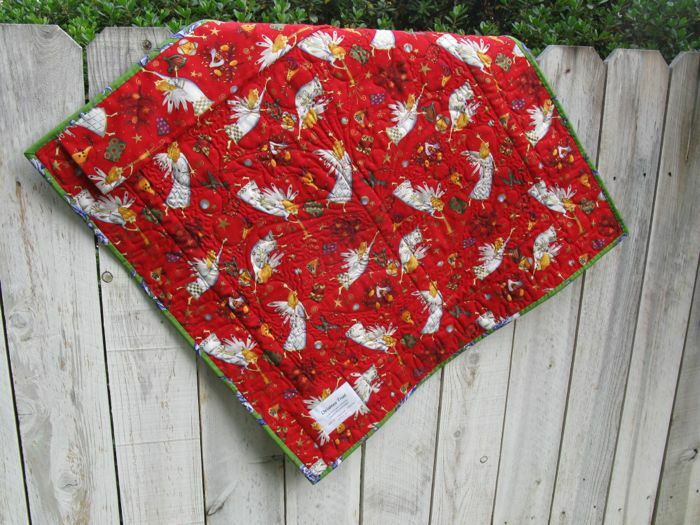 I think the chickens will look fabulous running around this quilt. Don’t we all have too many ideas? And not enough time? That’s my set for this week. Linking up to Lee’s WIP Wednesday. 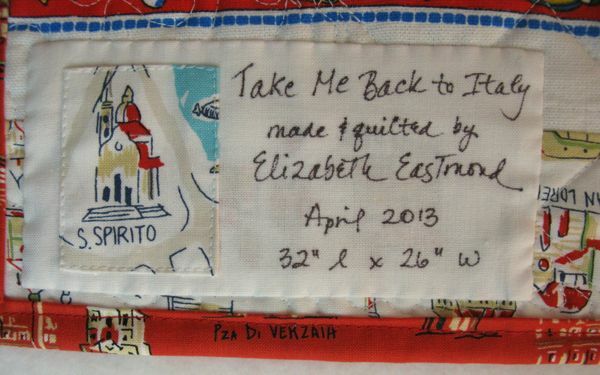 Posted on April 28, 2013 by Elizabeth E.
I’ve used QuiltPro software for about a decade now, choosing it first because it worked on a Mac as well as a PC (I’m a Mac user, and Electric Quilt has ignored people like me). 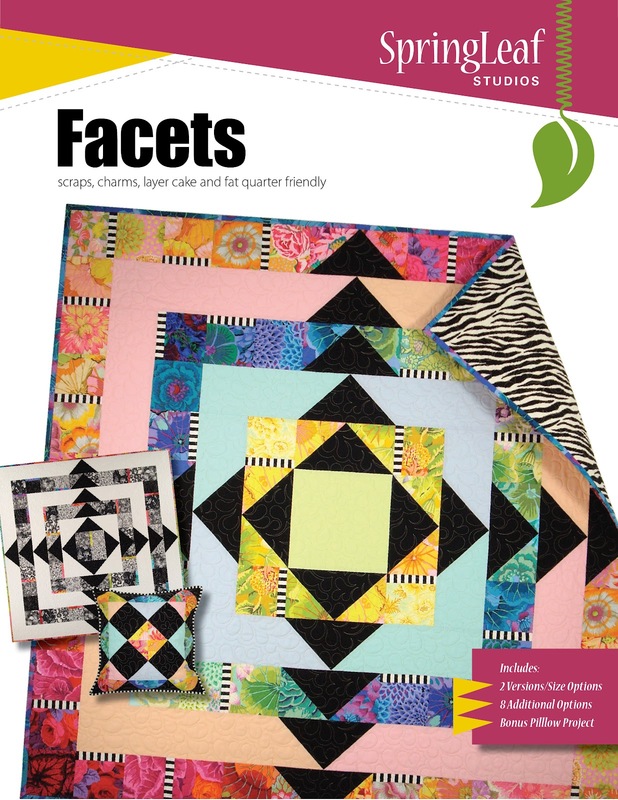 I’ve been reading about another quilt software program that you rent monthly, and thought I ought to talk about an alternative to that, especially since QuiltPro is having a sale right now of 30% off. 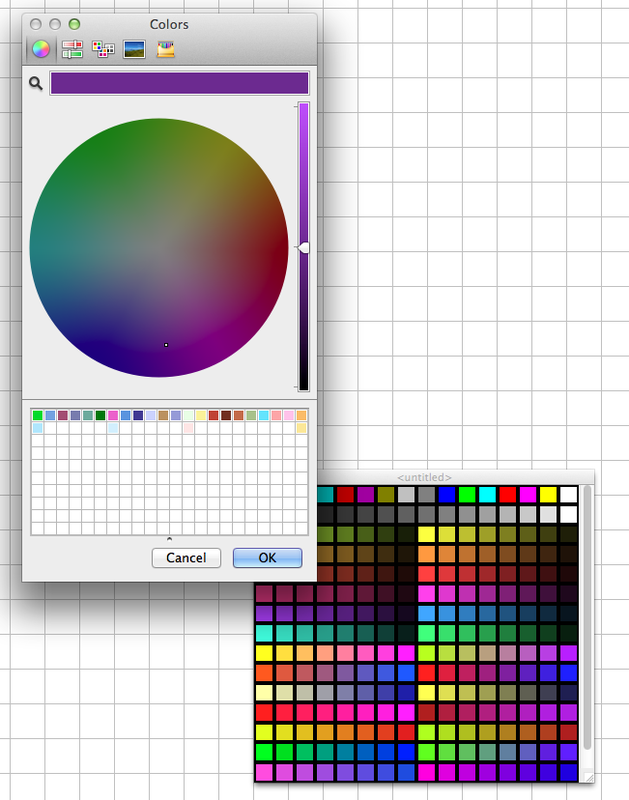 And if I want to, I can change the colors by double-clicking on one of the little squares. 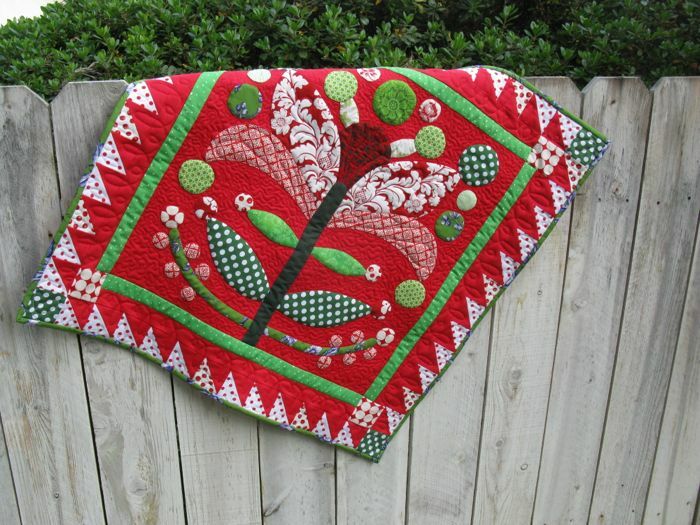 Sometimes when I read quilty blogs, I get the feeling that whatever is being shown, or pitched, becomes an extension of that quilter. That is to say, that if you buy this, or shop here, then that’s like a ‘vote’ for that quilter, and you say you like her better. 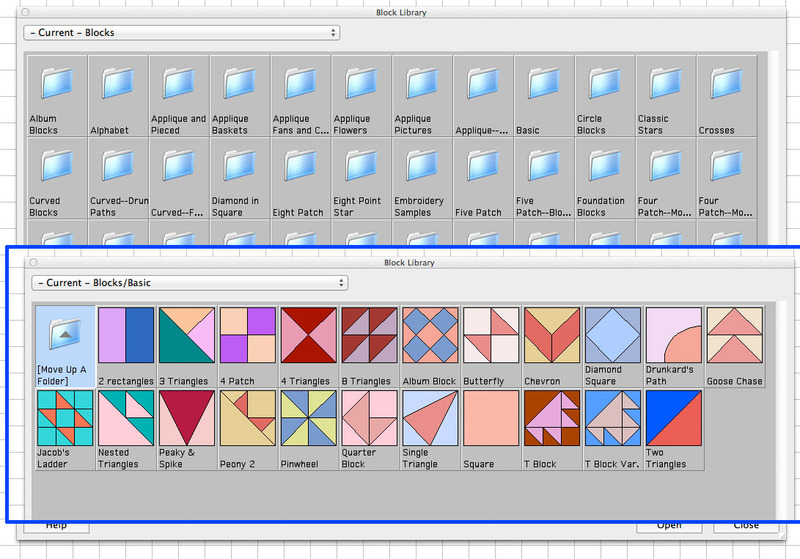 I don’t really care if you use QuiltPro or not. 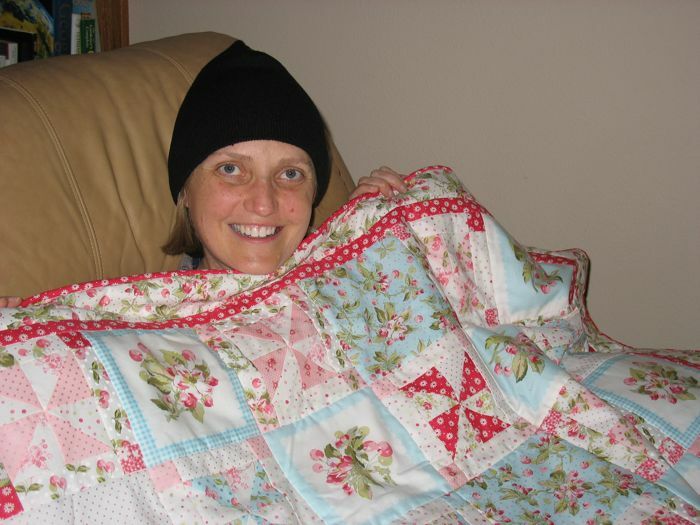 I do use it and I’ve had great success with it as a tool to help me get done what I really do love: quilting, so I thought you might want to know about it. 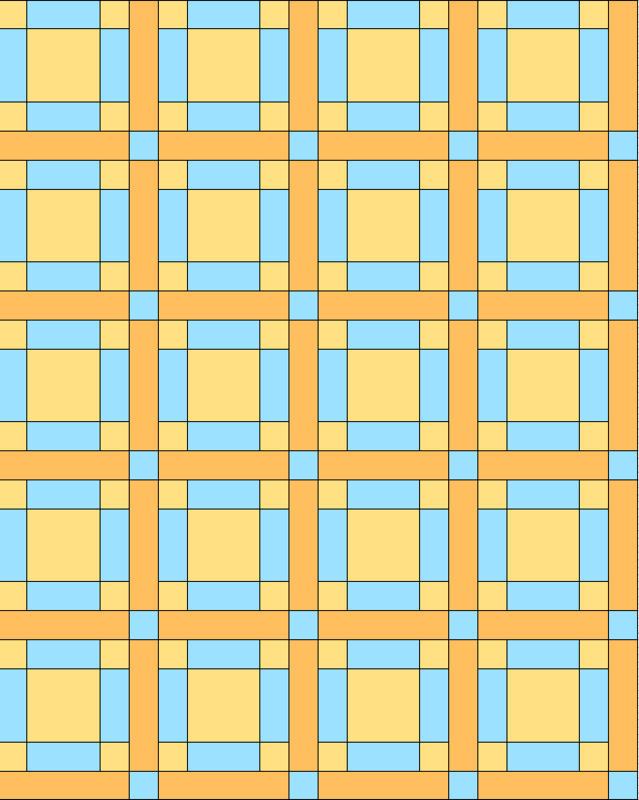 I used to draft blocks using graph paper, pencils, rulers, drawing out the templates by hand. This program does all that for me (yes, it prints the templates too, so I can measure them to use with my rotary cutter and rulers). It’s my tool. 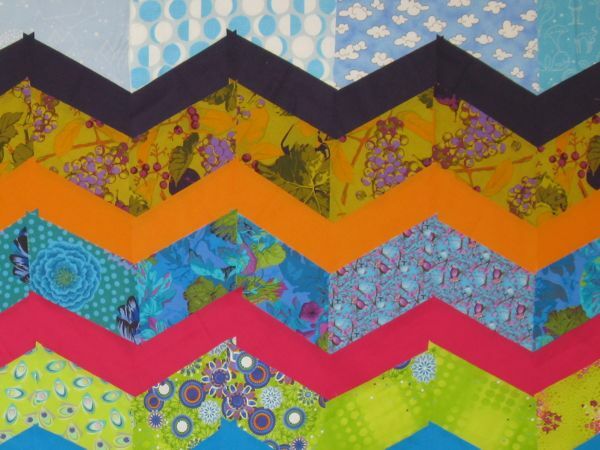 I’ve used this tool in my little quilt group, Good Heart Quilters, when we do our block swaps, or someone needs me to draft up how their chevron quilt will look. It’s been very helpful in a lot of ways. “Q: When you wake up do you feel a sense of loss when you realize what happened to your legs? 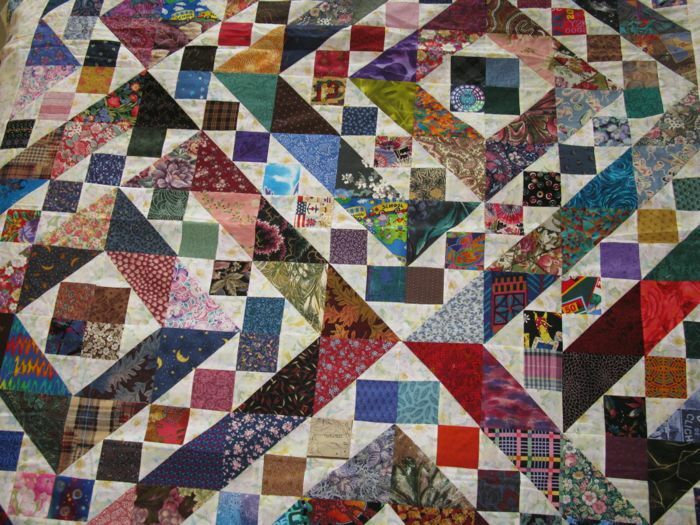 I want to fly my version of a desk–my sewing machine–making quilts and sewing and playing with cloth and squares and triangles and designs. 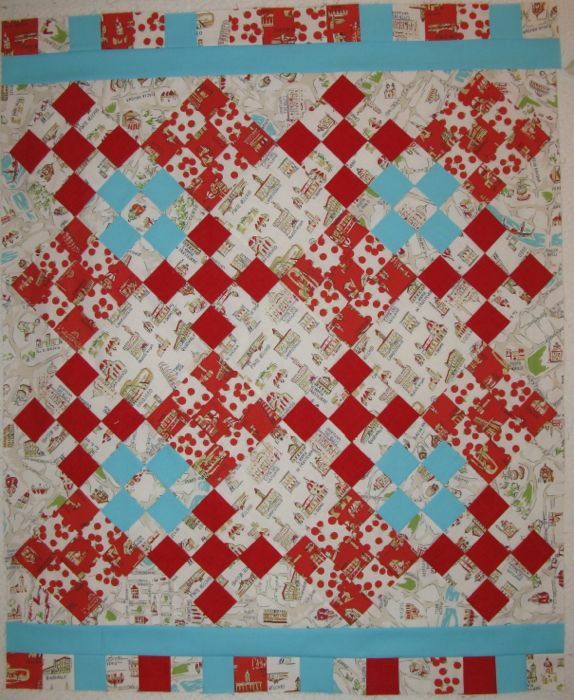 I love quilting and am happy to have my rotary cutters and rulers and yes, my QuiltPro software. It’s just a tool, you know, to get the quilting done. 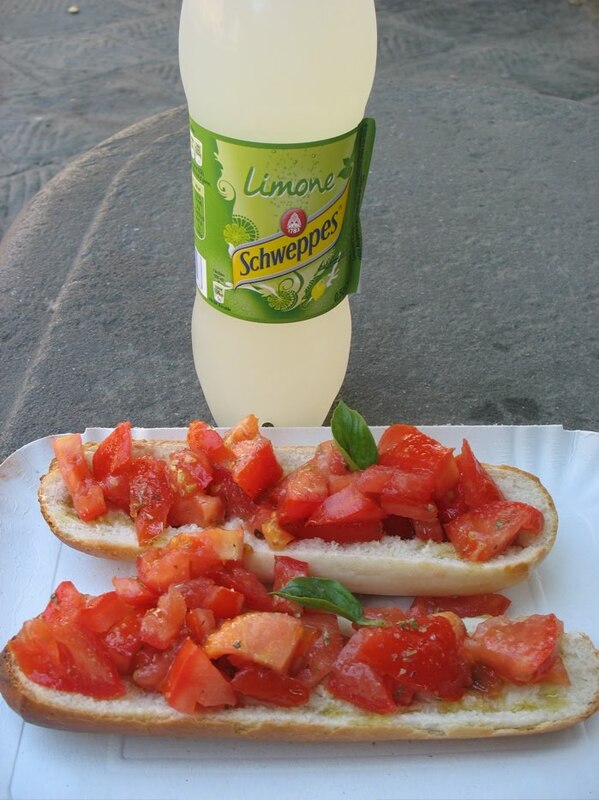 Take Me Back to Italy! 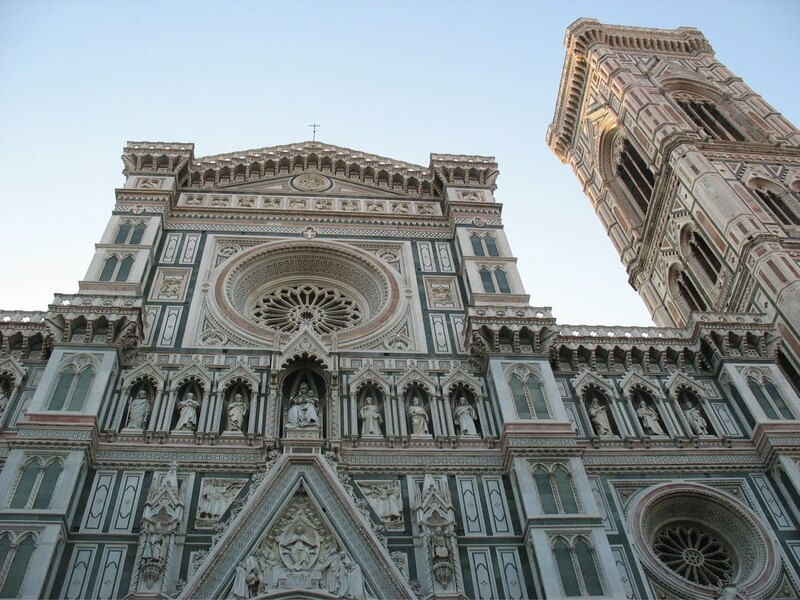 Posted on April 26, 2013 by Elizabeth E.
I have this thing for Italy. 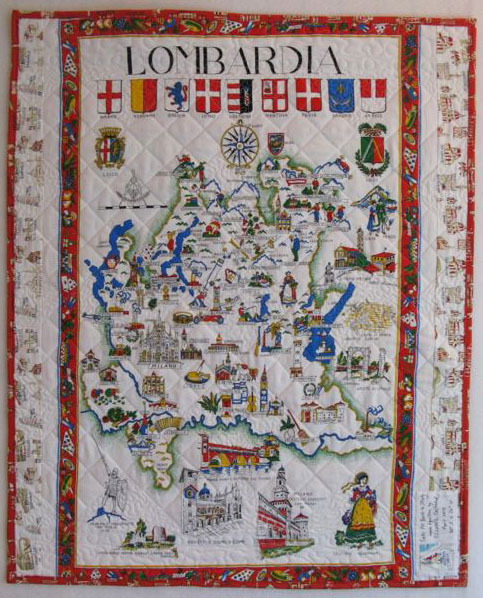 So when I saw Va Bene!, a line of fabrics depicting scenes and buildings and landmarks from Italy, it had to come home with me. 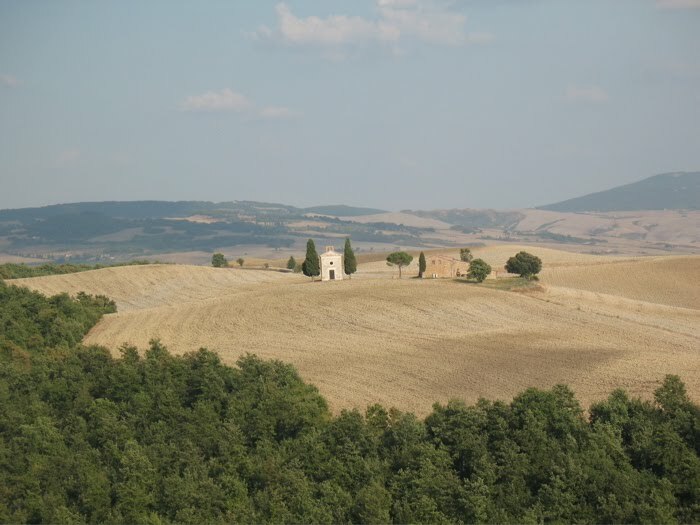 Many of our trips are detailed on my travel blog, Traveled Mind, which I’ve maintained for several trips, and it serves as a journal of sorts. 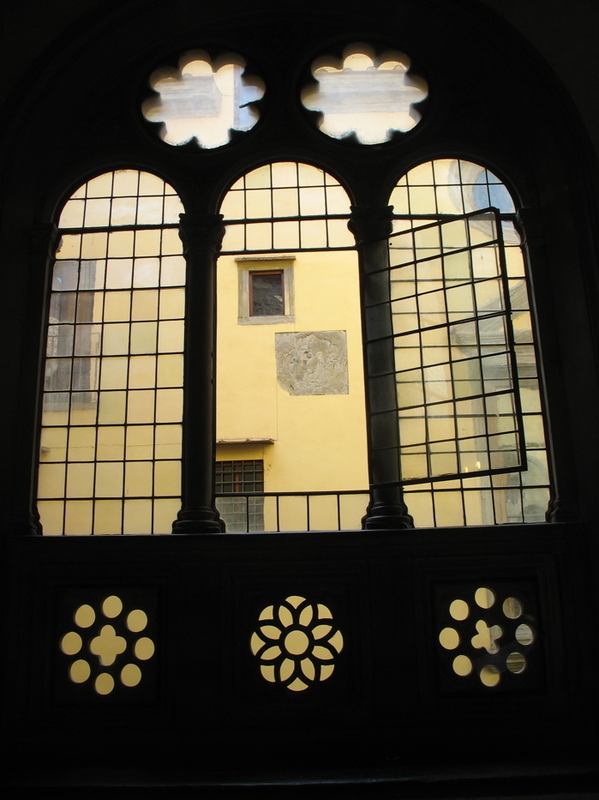 It’s always fun to go and read it to remember the perfect bruschetta pomodora in the courtyard just beyond the steps of Santo Spirito in Florence (and is why I put the snippet of fabric showing this on the quilt label). So with this memory floating in my mind, I fell in love with the tomato fabric and the sights fabric and the background fabric with the Venetian gondolas and knew that I wanted to make this for Another Year of Schnibbles that Sherri and Sinta are hosting. This was my first attempt. I ending up snipping off the piano key borders — even though they are in the original pattern — because everything seemed “mushed” together. 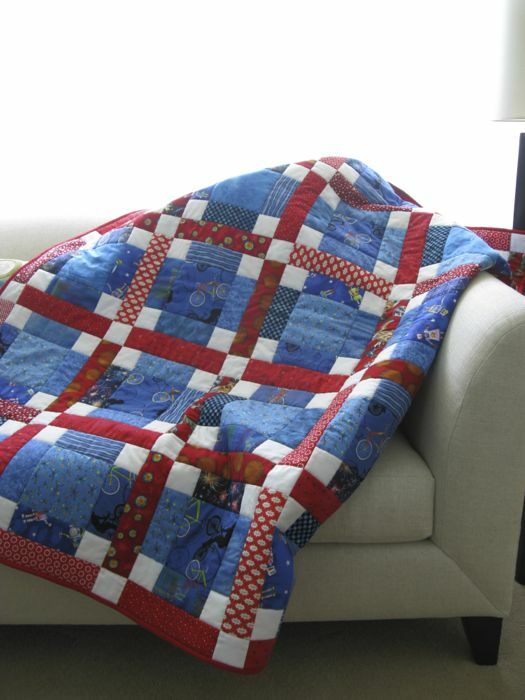 I think a quilt should have strong focal point, or perhaps several places where the eye can travel to, and with the borders and this fabric, it just wasn’t working. I also quilted the nine-patches in the ditch, and then did a heavy stippling on the triangles to smash them flat into the background, hoping the nine-patch design would pop up a bit. I think it also helped with that no place for the eye to rest thing I was talking about. 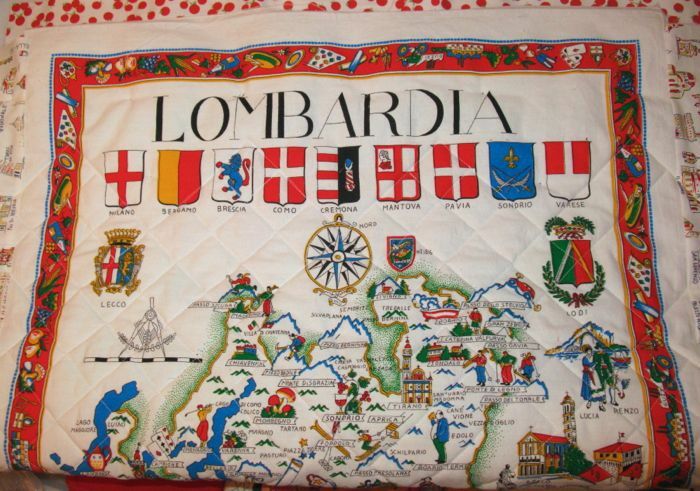 I’d purchased this tea towel on a very hot day when we were touring Lake Como, and tucked it away in the suitcase. 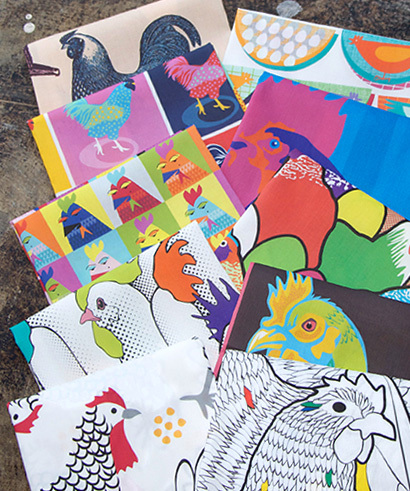 You can’t always find fabric in distant places, but there’s always a tea towel or two, showing the sights. My husband is a great traveler, very adventurous, and loves to rent a car and just drive around, trying new places to eat, finding the out of the way place, avoiding the tourist traps, although he will put up with a few if the sights are top notch. So Italy fits us well. Enough people speak English, the food is amazing, and the scenery is picturesque. 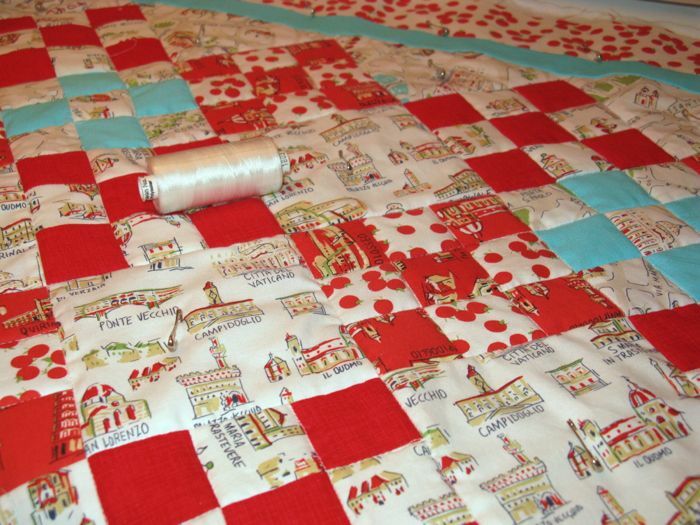 So what else could I name this quilt but Take Me Back to Italy? 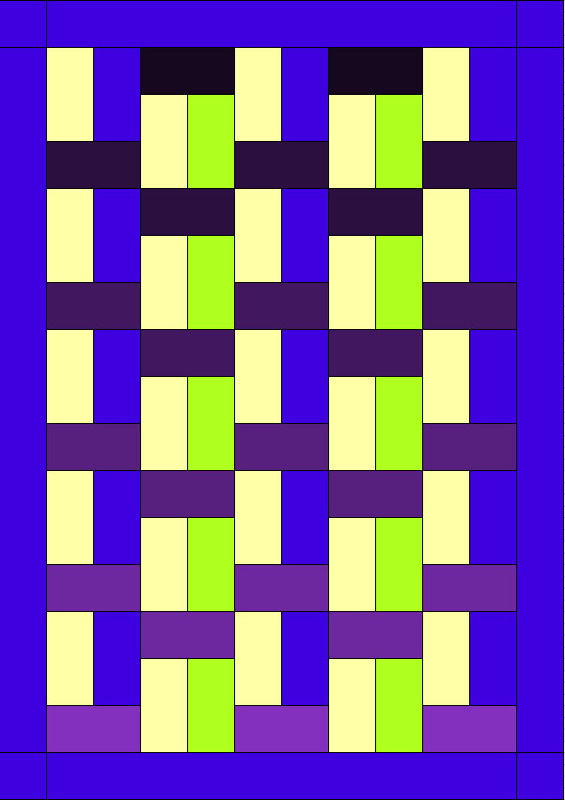 This is Quilt #112 on my 200 Quilts list.
. . . and my first Schnibbles in Another Year of Schnibbles. 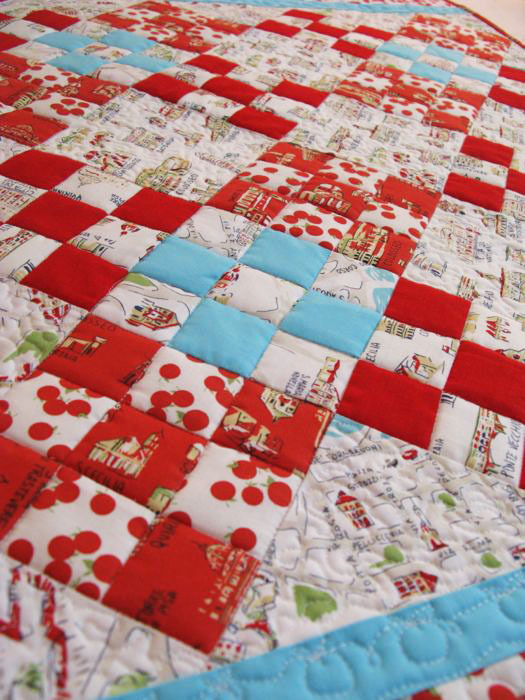 That’s a pretty big pedigree for such a small quilt, but this one can handle it. 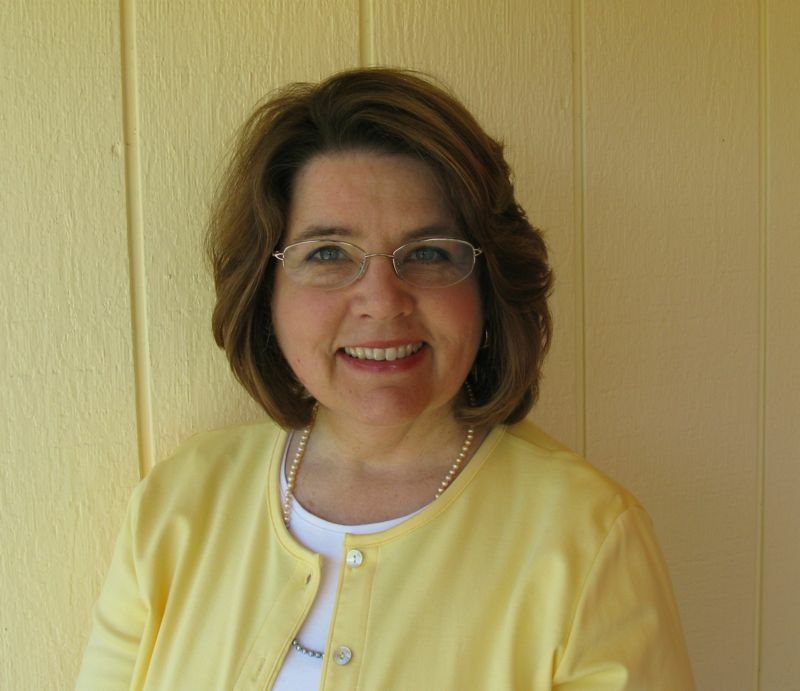 Posted on April 23, 2013 by Elizabeth E.
The last few weeks I’ve been the last person to post on Lee’s WIP Wednesday over at her blog Freshly Pieced. Or at least in the last five. There’s a whole bunch of us that bring up the rear–we’re kind of like in our own special club. We have our own T-shirt, motto and mascot. (I’m just kidding about the last part.) But I’m determined to be near the front of the bunch this week, so I’m posting this in hopes that I’ll be in the middle of the pack. Like how I’m mixing metaphors–Bunch (of bananas)? Pack (of wolves, or Cub Scouts)? That’s what happens when an English teacher gets tired. 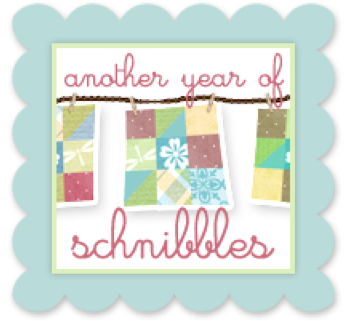 I’ve been working on Sherri and Sinta’s Year of Schnibbles quilt. 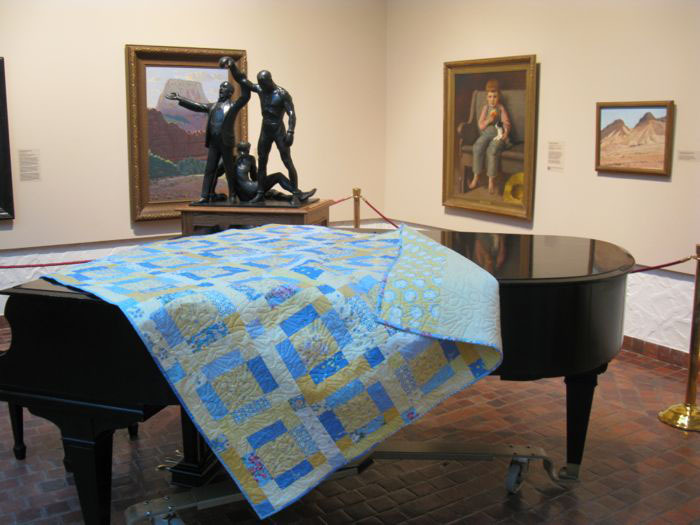 It’s an interesting size–bigger than my art quilts, smaller than my usual quilts. 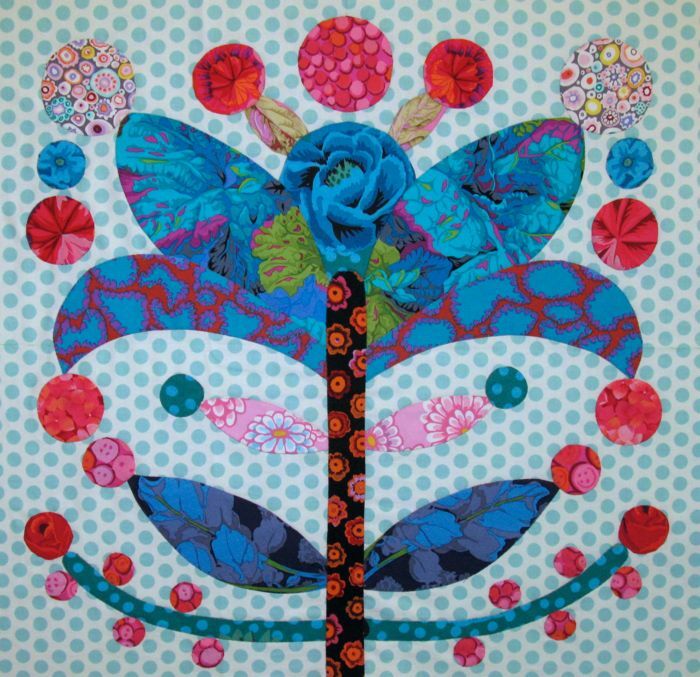 I love the Italy fabric by Dear Stella–there is still some in the Fat Quarter Shop last time I looked. And the tea towel I picked up on Lake Como is perfect for the back. 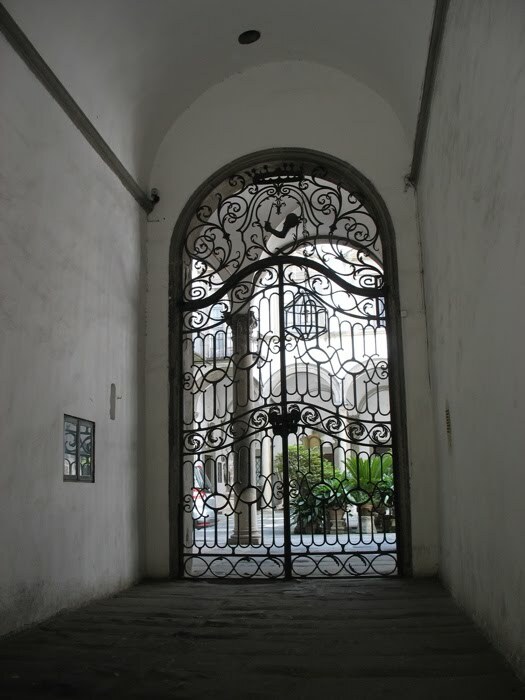 At first I thought I’d bought it in Milan, but it was so hot that day, all we did was hang out on the roof of the cathedral in the shade–I don’t remember buying anything. But I did hit the few shops that my husband would stop at when we were in Bellagio on Lake Como (and no, we didn’t see George Clooney). Anyone else has a husband who will just keep on walking when you stop to invest a few dollars in the local economy? Hmmm. Thought so. So that’s what I’m working on. I finished up the art quilt (check back in a couple of weeks for the Big Reveal), and you saw that I completed Christmas Treat (last post). When I know I have papers coming in (like I do in two days), I kind of wind down the sewing so I won’t be fretting while correcting mixed metaphors and cleaning up typos. I don’t want to be wishing I was sewing, although that’s next to impossible, really. 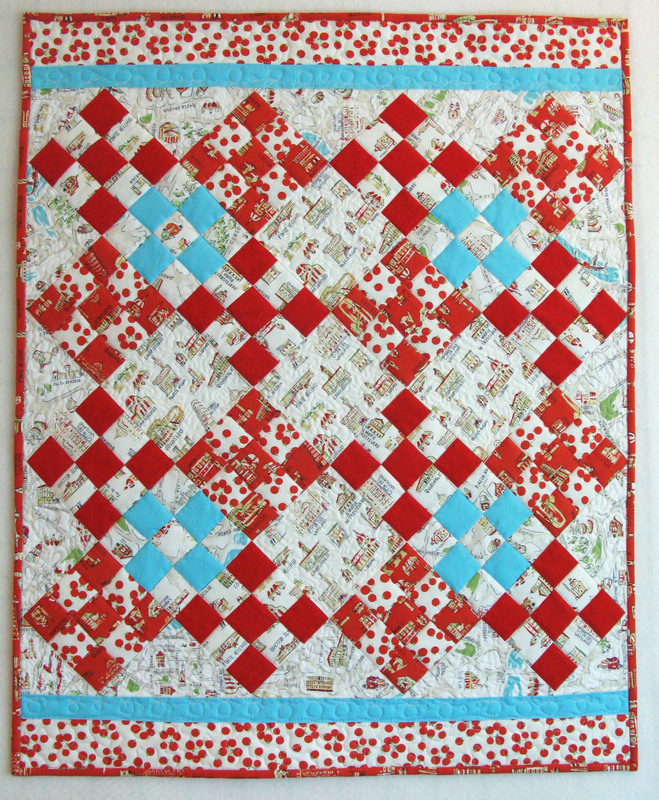 Linking up to Lee’s WIP Wednesday at Freshly Pieced. 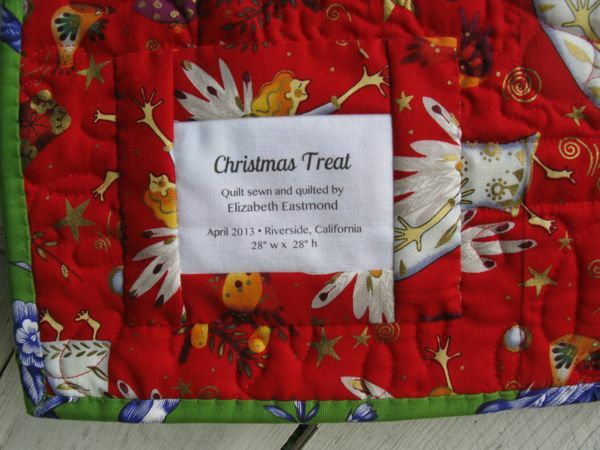 Posted on April 22, 2013 by Elizabeth E.
So, out here on the old sewing ranch-a-roo, I finished up Christmas Treat (name is courtesy of my husband–thanks hon!) and took it outside to pose for pictures. 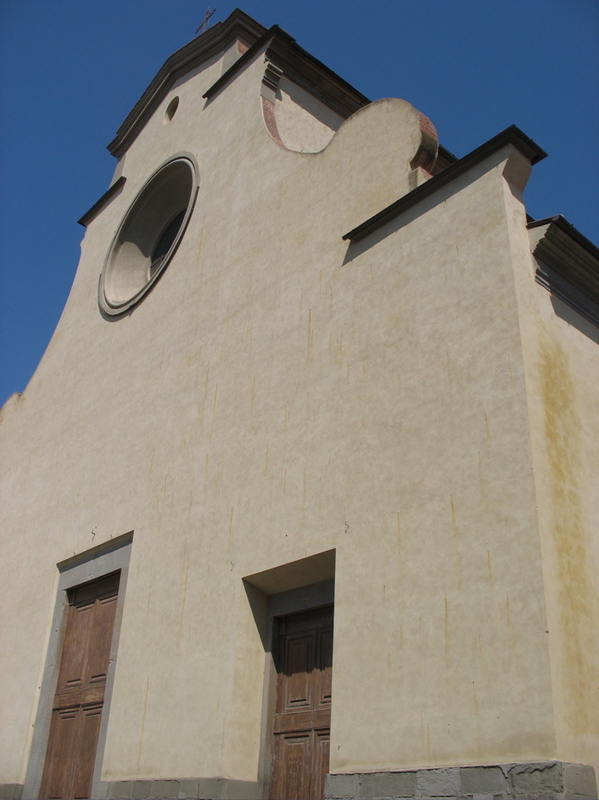 The front. The back is an old Alexander Henry fabric with quirky angels flying everywhere. I’ve hoarded this and now only have about a yard of the black colorway. The label. I like to print mine out and border them before I stitch them on. If you do a search for “labels” in the search box on the blog, you’ll find posts about how I do my labels. 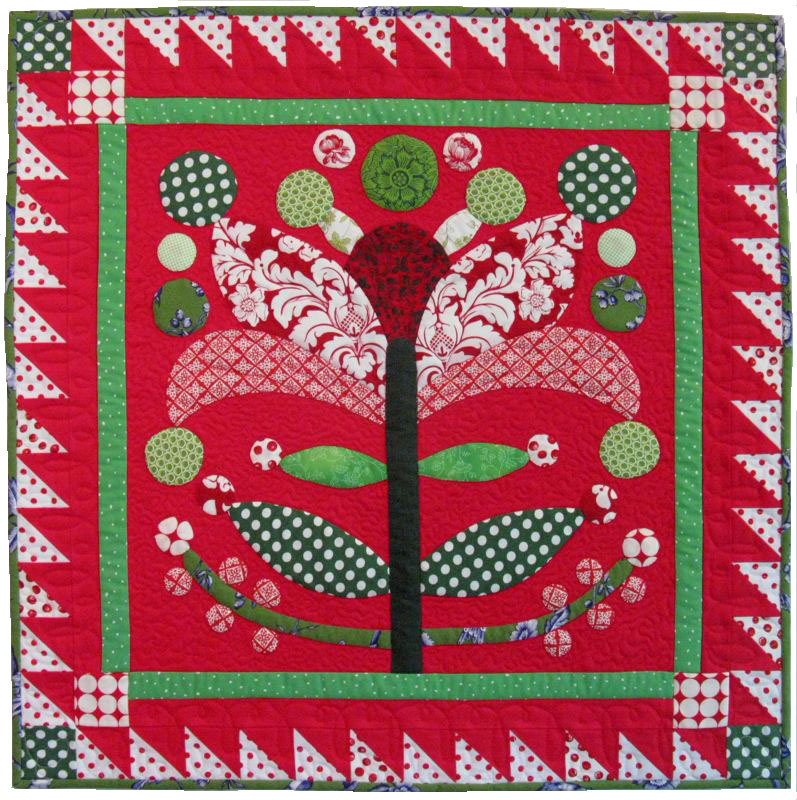 3–I took this sample (above, of Christmas Treat and below, of Lollypop Tree block) to Bluebird Quilts & Gallery, my local quilt shop, and she booked me in to teach two classes! I’m so jazzed! Now, to see if they carry. . .and. . .
4) my husband took a new picture of me that I think is a pretty good rendition of who I am at this point in my life. As the Mid-Century Moderns know, we scrupulously monitor our images, preferring instead to be behind the lens instead of in front of it. 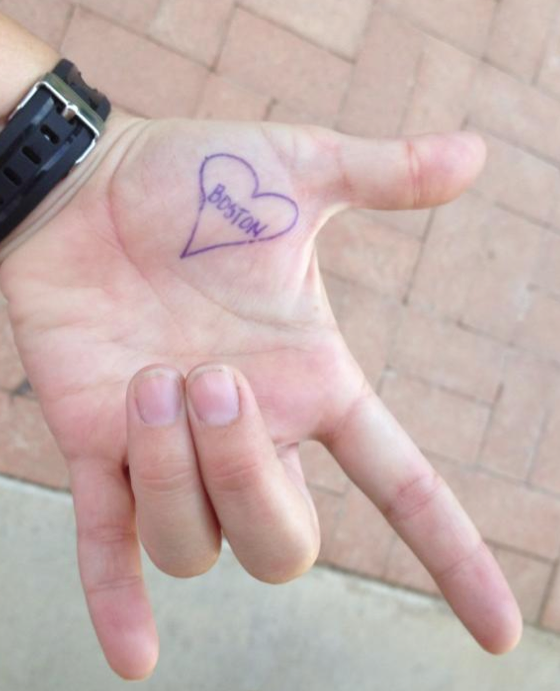 About photographs: we swim in a sea of digital images, and most are out of our control, as was demonstrated by the plethora of images that came forward about the Boston Marathon tragedy. Our grandparents had a handful. Our great-grandparents had, like, maybe three. So does having so many pictures make it any easier to find one you like of yourself, especially if you don’t look like Gyweneth Paltrow or George Clooney or some other cinema god/dess? If you’re like me, my husband took about ten shots before I got one that I liked–one that represented on the outside how I generally felt on the inside. So, here it is. Banish all other images to the dustbin. This is the me as I am this week, all sunny yellow in sunny Southern California. Class will be taught at Bluebird Quilts & Gallery, at 22320 Barton Road, Suite A, in Grand Terrace, California (just north of Riverside). I’ll teach Wednesday, May 22nd from 10 to 3:30 p.m. and July 29th, from 10 to 3:30 p.m. I need at least four, preferably, five people to carry the class. 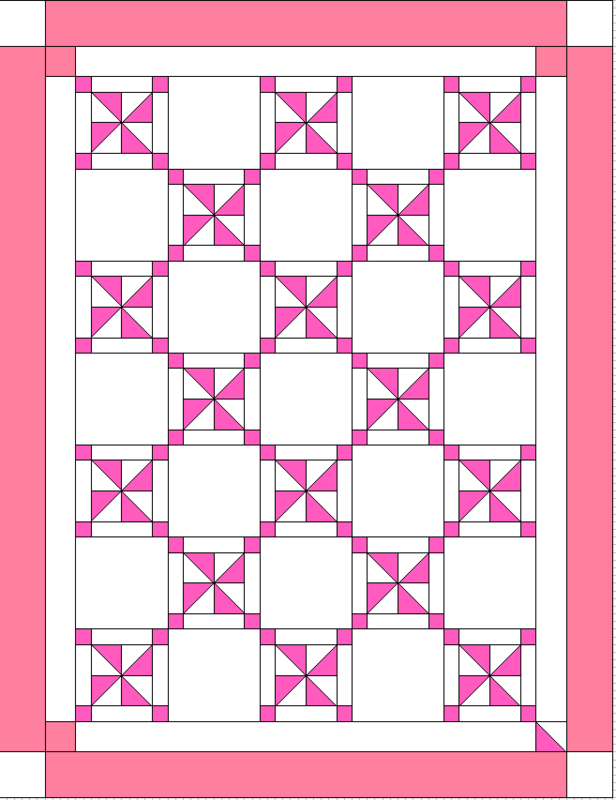 I’m including the pattern (my own, drawn from the original Lollypop Tree quilt from the 1880s), and freezer paper (have you priced this stuff lately? Whew!). Cost is $50/full day class, including pattern. Call the shop (909) 514-0333 to sign up, if you think you’d like to take the class. They’ll have class supply lists for you when you sign up. Their hours are Sunday through Thursday from 10 a.m. to 6 p.m. and Fridays from 10 a.m. to 3 p.m. Closed Saturdays.